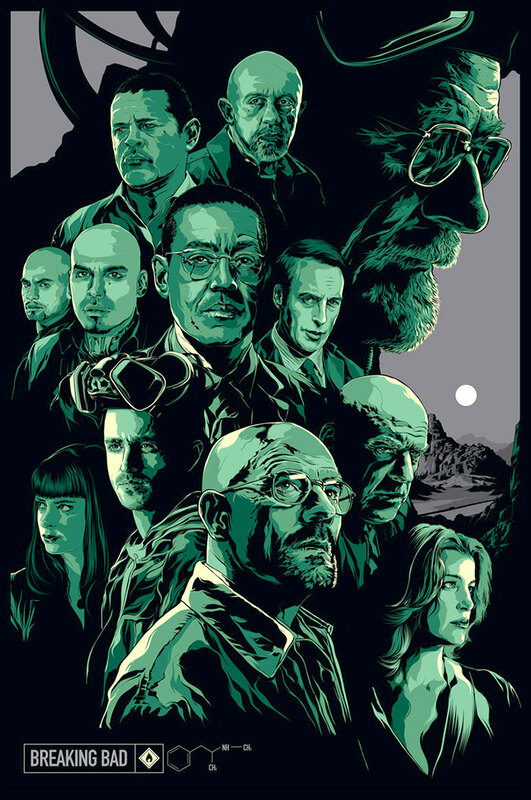 The final poster of the viral campaign run by Gallery 1988 for the Breaking Bad Art Project. It was released in August 2012 and is stunning, a real fan favourite. There was 300 produced and were originally priced at $150. They measure 24”x36”. Hands down the best show on TV, forget Walking Dead or Game of Thrones, The saga of Walter White is scripted TV at its best. Created by Vince Gilligan and starring Bryan Cranston, the story follows Walter White, a chemistry genius turned high school teacher, who upon learning that he has lung cancer teams up with one of his former students to cook and sell the world’s purest crystal meth.